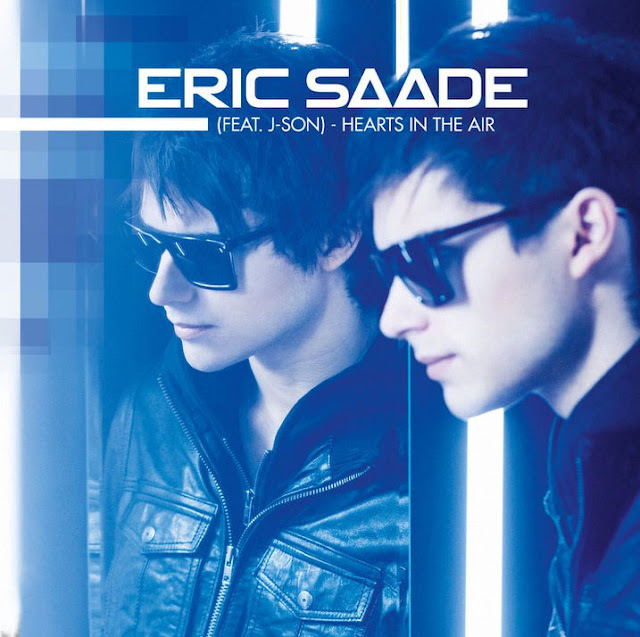 Swedish singing sensation Eric Saade is BACK with yet another hot, fresh electropop single. "Hearts In The Air" is the third single from Saade's sophomore album, Saade Vol. 1 and features Brazilian-born rapper J-Son. The single was released in Sweden on June 7th via Roxy Recordings (Agnes, Erik Hassle), entering the Swedish Singles Chart in the #2 spot, while the album came out June 29th, debuting at #1 on the Swedish Albums Chart. The single is an easy breezy summer pop single full of plenty of punch and attitude. 20 year old Saade is turning into quite the little popstar, isn't he? The Patric Ullaeus-directed video, which premiered June 28th on YouTube comes across as a little amateurish...kind of a lower budget version of a Taio Cruz video but no matter. It's all about the song here, which is hot. Eric Saade competed for his native Sweden in this year's Eurovision Song Contest, coming in third place in the final, Sweden's highest Eurovision placement since 1999 when Charlotte Nilsson won the contest for her song "Take Me To Your Heaven." "Manboy," Saade's Eurovision entry, was written by Fredrik Kempe and Peter Boström and debuted on the Swedish charts at #1. While music is a big part of Saade's live these days, he did make a name for himself and earn some more fans back in 2009 when he hosted a popular music reality show called My Camp Rock, a Scandinavian series based on the hit Disney movie Camp Rock. Since then it's been a bit of a whirlwind for Saade, who released his debut album, Masquerade in 2010, watching it go all the way to the #2 spot on the Swedish Album Chart. The album spawned 2 top 50 singles including "Sleepless" and his eventual Eurovision contribution, "Manboy." Drawing inspiration from the original 'King Of Pop,' Michael Jackson, Eric Saade has always known what he wanted to do with his life. his first stage performance was at the age of six when he sang at his mom's wedding. While music isn't Saade's ONLY interest (football is another), it is the one that guides his path today. While he's content with his Swedish success at the moment, cracking the notoriously difficult UK music scene is a future goal. I'd say at only 20 years old, Eric Saade has some time to turn that dream into a reality. What do you think, does he have what it takes to becoming an international pop star? Download "Hearts In The Air" on Swedish iTunes HERE and check out the video below. 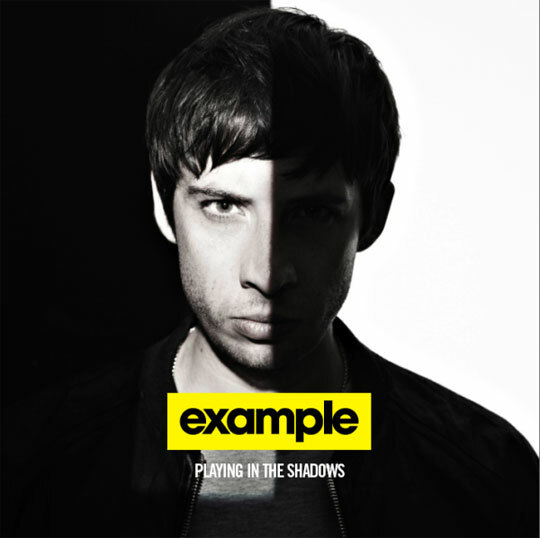 English rapper Example recently unveiled the album artwork for his upcoming third studio album, entitled Playing In The Shadows. The artwork features a VERY SERIOUS looking Elliot Gleave with half of his face covered by a...you guessed it! A shadow. The artwork is simple, but sleek, with black lowercase letters inset in a bright yellow box, which provides the only splash of color on the album cover. Featuring production from Chase & Status, Nero, Funkagenda, DC Breaks, Laidback Luke, Feed Me, Michael Woods, Skream and Faithless, Playing In The Shadows is due out September 4th in the UK via UK dance label Ministry of Sound. Can't wait! The album's first single, the Michael Woods-produced "Changed The Way You Kiss Me" was a UK chart topper for two weeks in a row, even beating alt rock mainstays Coldplay and selling over 200,000 copies. Pretty effing cool Mr. Example! The second single, "Stay Awake" is...dare I say it? Even catchier than it's predecessor. Produced by Nero, the single made it's debut on July 1st on BBC Radio 1 by DJ Annie Mac and is set for release on August 28th. Featuring the same classy mix of electro and hip-hop beats as previous singles, the success of the first single bodes well for Example. Here's hoping the new single is successful, although being backed by remixes from Micky Slim, Moam, Alvin Risk, Delta Heavy and Steve Pitron & Max Sanna, there's no reason it shouldn't be! Having already performed at this year's Glastonbury Festival, Example will take to the stage at a number of other UK festival this summer, followed by a 17-date headlining tour in the UK in November and December. Download what there is to download (it isn't much) on U.S. iTunes HERE. UK peeps download "Changed The Way You Kiss Me" on UK iTunes HERE.